Those looking for the best way to lose abdominal weight may be disappointed to find out that they can't really control where weight loss occurs. However, some dieting strategies paired with exercise can trim the waistline. One diet stands out as the most viable option for losing belly fat. Losing extra weight around the waist is more of a matter of health than it is a matter of vanity. Much of the excess fat in the abdomen area consists of visceral fat that surrounds vital organs. This type of accumulation differs from subcutaneous fat, which is located closer to the surface of the skin. Those who have excess abdominal weight may have a significant amount of the dangerous visceral fat around their organs. Getting rid of this accumulation naturally leads to better health and improved organ function. There are considerable obstacles with target area weight loss. Typically, the body loses fat in a systematic fashion, with the most recent accumulation disappearing first, followed by older accumulations. Those who have carried extra weight in the abdomen for a long time followed by fat accumulations showing up on different parts of the body later can expect to lose weight in the different parts of the body that experienced the latest weight gain first. Those seeking to get rid of c-section belly fat have the extra challenge of dealing with possible muscle tone loss and tissue damage. Some suggest that it is impossible to get a flat belly after this type of operation. This is no reason to despair, because one diet appears to have developed a way to target belly fat, particularly the troublesome visceral buildup. 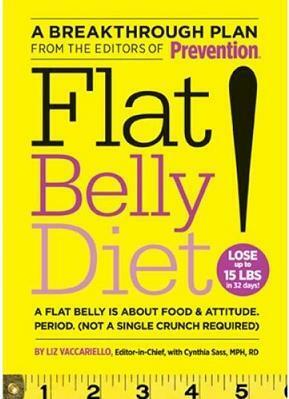 The one diet that stands out as possibly the best way to lose belly fat is the Flat Belly Diet. It is a program affiliated with Prevention Magazine that targets the stomach area. The program does share some components of the Abs Diet but Prevention's system appears to be more effective. The program uses fat to reduce fat build-up, particularly monounsaturated fats, referred to as MUFAs in the plan. Having a MUFA with each meal is the foundation of the plan. Foods that contain these fats are often forbidden in weight loss plans. Proponents for the program suggest that the healthy fats makes dieters feel full and satisfied and it naturally helps to reduce fat in the abdominal region. Does the Flat Belly Diet Work? The diet works, and it is among the best ways to whittle your waist but there are some problems with the plan. First, the program suggests that exercise is not necessary in order to lose the excess weight. Although it does tell dieters that exercise will improve their results, little focus is put on this critical aspect of weight loss. The program does not include polyunsaturated fats (omega-3 fats) that can also help to reduce visceral fat. The lack of omega-3 fatty acids can be a problem since this healthy fat is essential to good health. You can maximize belly fat loss by including regular exercise in your weight loss routine. While exercise is not necessarily effective in helping you to lose pounds and inches in specific areas, it can help burn more calories. If you consume fewer calories than you use, fat loss naturally occurs. Aerobic exercise is ideal as weight loss exercise because it burns a significant amount of calories. In addition, you can tone and strengthen the abdominal area with stomach flattening exercises. Hydration is a critical aspect of losing weight in the abdominal region as well. Drinking water creates a rapid transit of waste, including toxins and excess body fat. When you become dehydrated, your body naturally holds on to water for later use, similar to the way that it stores fat for as a source of energy. The body protects itself by storing water when it feels dehydrated. This survival mechanism can show up as bloat in the lower abdominal region. The best way to lose abdominal weight in this region is to stay well hydrated to prevent the accumulation of water bloat.